Eat this and Save the Caribbean’s Coral Reefs. In May, I was in Miami and had a chance to visit the Phillip and Patricia Frost Museum of Science, which had an exhibit on coral reefs, mangroves, and sea grass ecosystems. 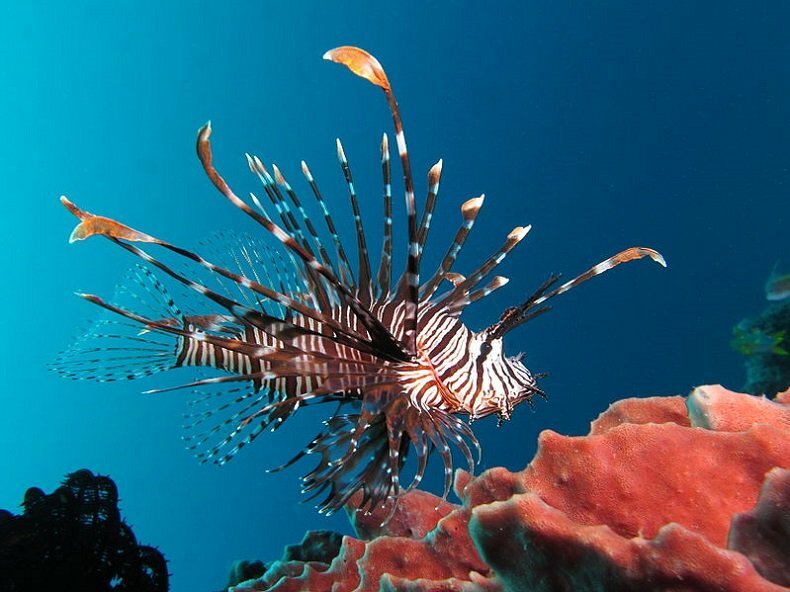 Lionfish are native to coral reefs of the South Pacific, but they are considered an invasive species in the Atlantic Ocean and the Caribbean Sea, as a non-native organism. Upon seeing lionfish swimming gracefully in the tank, I immediately thought of Jennifer Chapman. Chapman is a British Conservationist based in Belize who is dedicated to eradicating lionfish in the Caribbean. She accomplishes this objective by using innovative market-based approaches to conservation to protect and conserve coral reef ecosystems and to promote sustainable fisheries. When you’re finished reading this, you’ll know a bit more about lionfish, their impact on coral reefs and fisheries, and how you can support conservation efforts, like those led by Chapman in Belize—even if you live a thousand miles away—by eating. In the 1980s, lionfish were accidently introduced into the Atlantic and have since overtaken the Caribbean, devastating fish and invertebrate communities on coral reef ecosystems throughout the region. With Caribbean ecosystems already weakened by the effects of overfishing and climate change, the lionfish invasion is driving dramatic reductions in the overall fish population. Lionfish feed on young grunts, snapper, grouper, and other fish that are important to local food security and for the export market in the Caribbean. Chapman was born in England, but now lives in Sarteneja, Belize. Sarteneja is the country’s largest fishing community and the second largest village in Belize. Most of her efforts have been focused on the Bacalar Chico Marine Reserve that covers 130 km of the beautiful Belize Barrier Reef and Rocky and Robles Points. The beachfront of the coral reef ecosystem has extensive mangrove lagoons and is also a popular nesting area for Loggerhead turtles. The mangroves also serve as breeding grounds for marine and coastal birds—and as a nursery for many reef fish, like Nassau Grouper and Red Snapper, which are threatened by lionfish. Lionfish are a particular menace for Belize. Both fishing and marine tourism support the livelihoods of over 15,000 people and contribute 25 percent to Belize’s GDP, so it’s important that any threats to either be met head on. I first met Chapman in 2014 when we were both attending the Kinship Conservation Fellowship program in Bellingham, Washington, at Western Washington University with 18 other fellows from around the world. Chapman has been working in Belize since 2011. She started as a field scientist and quickly became Blue Ventures’ Country Coordinator in 2012. Blue Ventures is an environmental organization dedicated to rebuilding tropical fisheries with coastal communities by focusing on innovative market-based approaches to conservation. While the complete eradication of lionfish isn’t possible, Chapman mentioned that suppressing populations on coral reefs allows native marine species to recover. This is one of the goals of Blue Ventures. Chapman has been overseeing Blue Ventures’ efforts to engage coastal communities and artisanal fisherman to suppress lionfish populations. She achieves this goal by teaching fishermen the benefits of catching lionfish for the local and international seafood markets, while training women to produce products, like jewelry, made from lionfish. She has pioneered efforts to commercialize Belize’s nascent lionfishery by working with fishers, consumers, restaurants, fishing cooperatives, and seafood distributors. Demonstrations for fishers have been held regularly in Sarteneja in order to provide practical training in adapting fishing techniques to target lionfish. Since 2013, Blue Ventures has expanded this program to fishing communities across Belize. “Tasting” events have raised the profile of lionfish throughout Belize as an edible, tasty fish; it is now regularly used in restaurants and in home cooking. Reduced predation of juvenile reef fish and decreased competition for resources with native groupers and lobsters. Diversified fisheries reducing pressure on Belize’s two main target species, conch and lobster, both currently overexploited. An alternative target species with no seasonal closures or size limits, reducing illegal fishing. A sustainable seafood choice for consumers. The project is an innovative, market-based approach because lionfish management requires consistent, regular removal of a large proportion of the population to effectively suppress lionfish populations. In order to get fishermen to shift their fishing practices, they have to have a financial incentive to do so, and that’s what Blue Ventures is working with them to do. The more lionfish caught, the more effective suppression of the population is, which permits native fish populations to recover. To conduct the necessary high removal rate at scale would be extremely expensive if it were not linked to income generating, incentive-based activities such as fishery development, lionfish tournaments, and recreational culls and dive tourism. Monitoring and evaluation of the program’s success focuses on a range of social, economic, and biological indicators such as restaurant performance, household income, public attitudes, knowledge indicators, fishery-catch rates, and in-water monitoring of lionfish populations. Blue Ventures’ goal is to scale up from a focus in northern Belize to national and international efforts. With a demand for invasive lionfish fillets in the United States currently outweighing supply by 400 percent, Chapman’s team is working with Belize’s largest fishing cooperative (the Northern Fishermen’s Cooperative Limited) to develop avenues for the bulk exporting of frozen lionfish to the U.S. There are a few simple actions that consumers in the U.S. can take to support these efforts. If you’re traveling to Belize, look for products made from lionfish and know that every purchase helps conservation efforts as well as local women. The most important action you can take is to demand that your favorite seafood restaurants stop serving threatened or endangered species, like Bluefin Tuna, and ask them to start supplying and selling lionfish instead. In turn, eat lionfish when it’s on the menu. If you’re not sure where you might find lionfish, use this simple guide before you travel to coastal states in the southern United States or anywhere in the Caribbean. If you want to amp up your involvement with ocean conservation efforts in the United States, here’s a step that you can take, whether you live in a city on the coast or inland: get involved by joining a local organization or group focused on ocean, marine, and coastal conservation. A few months back, I checked out what kind of opportunities there are in Boulder, and I came across the Colorado Ocean Coalition. I contacted the founder, Vicki Nichols Goldstein. Goldstein informed me that she recently spearheaded the creation of an Inland Ocean Movement, so that those who don’t live on the coasts can still engage the issues. If you’re not familiar with the challenges coastal towns and cities confront, you can start by reading this “Ocean Cities” article that I wrote a few months ago for Elephant Journal. Finally, if you’re in Miami, the only restaurant that I could find that serves lionfish is the Bazaar Mar by Chef José Andrés, but give them a jingle before you arrive, because they don’t always have lionfish on the menu. But, the more you ask and the more you demand lionfish, the more likely we’ll be able to protect and conserve the ocean’s reefs, while supporting local livelihoods and sustainable fisheries.